Brooklyn & Boyle, LA's premiere Latino arts, culture & community monthly is once again pleased to share its unique perspective on the creative communities across the Greater East Side and beyond. In an effort to improve the publication and appear monthly at the beginning of each month from now on, an effort you, as readers and sponsors, have made possible as we move into our fourth year of publication, we will begin publishing at the beginning of each month. With our July issue, due in two weeks, we once again bring you more of the great stories, interesting features as well as book, film, theater, columns and opinions you have come to love and expect, only now, it gets even better with special cover story on a major museum in LA County that was willing to share an exclusive scoop with our editorial staff, a move that means good news for both Angelenos across the Southland and art aficionados the world over. That's really all we can say, because we can't give the story away, at least not just yet. Beyond that, we're excited to have Harry Liflan Ortiz AKA "El Art Pocho" back with a story on the Cinemateca tribute to legendary filmmaker Luís Buñuel. Senior Associate Editor Thomas Varela profiles new ACLU San Diego office director Norma Chavez-Peterson, the first Latina woman to assume such a nationally prominent post. 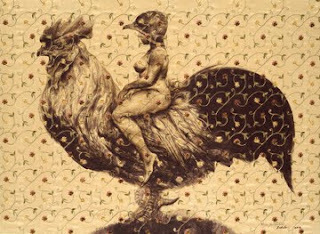 On the art front, Brooklyn & Boyle takes a look at the provocative and fanciful work of Cuban artist Roberto Fabelo (image above) who opens his first one-man exhibition in the U.S. at the Museum of Latin American Art (MOLAA) in Long Beach this month entitled "Fabelo's Anatomy." Belinda "Deedee" García Blase, a controversial co-founder of the National Tequila Party, a non-partisan independent Latina-led movement that has supported passage of the DREAM Act and opposed Arizona politicians with outdated views and positions with regard to immigration, offers an interesting editorial this month called. "Joaquin Joaquin, Joaquin." She has been a strong advocate for immigrant rights and a regular contributor to the Huffington Post. Again, we intend to provide you with our very best and invite you to drop us a line at anytime. Of course, business owners and community leaders are warmly invited to help support our fine publication with advertising. We look forward to helping you communicate with almost 10,000 readers a month. We thank you for your patronage and support as we move forward with a new and improved version of our news monthly. Our deadline for ad copy and artwork is January 1st. Rate cards are available upon request, and we are happy to discuss frequency discounts.